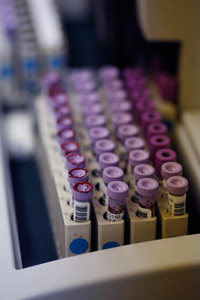 The Department of Pathology of Montefiore Medical Center and The Albert Einstein College of Medicine provides diagnostic services for patients through the examination of patients' tissues obtained during surgery or biopsy procedures and through the testing of blood, urine, and other body fluids. The Department is unique among area hospitals in that its pathologists and laboratory Directors maintain national and international reputations in their fields of expertise. In the fields of diagnostic surgical pathology our physicians have expertise in the diseases of the head and neck, breast, endocrine organs, brain and nervous system, reproductive system, bone marrow and lymph nodes, lung, kidney, prostate, bladder and gastrointestinal tract. They are particularly skilled at cancer diagnosis and receive referrals from other medical centers around the country. Our cytologists are world renowned for their work with Pap smears and final needle aspiration of suspected tumors. In the field of laboratory medicine we operate the most technologically advanced diagnostic systems, analyzing approximately three and a half million specimens a year. This testing is supervised by a team of physician scientists who are leaders in the fields of hematology, endocrinology, rheumatic diseases, microbiology, virology and the laboratory diagnosis of heart disease, liver disease, and AIDS. Our Department is fully accredited by, and is a participant in the Quality Assurance programs of the College of American Pathologists.